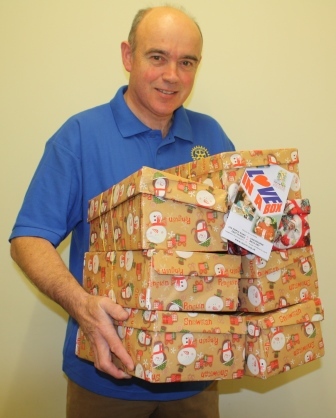 ‘Love in a Box’ is a project that has been running for over ten years by an organisation called ‘Mustard Seed’; and Rotarian Stephen White is the Bexhill Rotarian who has been co-ordinating their response this year for ‘Mustard Seed’. This charity, based in Eastbourne, that delivers these boxes to children throughout the poorer parts of Eastern Europe. Each lorry contains about 8,000 boxes, and such is the operation that over 50,000 Christmas-wrapped shoe box sized parcels are to be delivered this November and December. RC Bexhill has contributed 120 boxes which were delivered to the depot by Stephen and Bexhill club President John Cooper and RCB’s Press Officer, Roger Batey. Stephen White commented that he had never seen so many presents in one place, and it opened his eyes to a huge logistic operation. ‘It’s good to know that so many under-priviledged children will have a really happy Christmas.’ he added. The club also got some help – the children of St. Mary’s in Bexhill also added to the total. In all just another way that Rotary clubs in the district are working with their communities to make things better worldwide! As part of the event to celebrate the visit of the Olympic flame to Bexhill on 17th July, the students of St. Mary’s Wrestwood Trust College held there very own torch relay around the grounds of the school and college in Wrestwood Road. 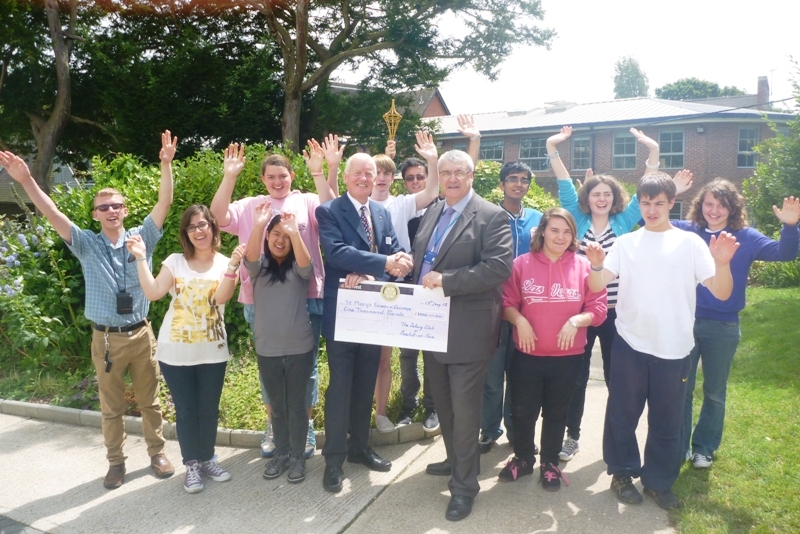 As part of these celebrations, Mike Barton, President of Bexhill Rotary Club, presented a cheque for £1,000 to the Head of College, Craig Ribbons, and the students who were selected to carry their own torch in the relay. The donation will be used to help fund the cost of taking every student at St. Mary’s on a very special outing to visit the Olympic stadium in London on 6th September where they will enjoy a day at the Paralympics. St. Mary’s is a non-maintained school and college founded in 1922 and cares for up to 144 students from 7 to 19, sharing with their parents the responsibility of preparing them to become as independent as possible and ready to realise their full potential. St. Mary’s provides therapy, nursing, care, and education for the children in their care (a recent Inspection Report stated, “St. Mary’s gives pupils an outstanding education”) but receives no grants or donations from Local Government and only minimal funding from Central Government. Bexhill Rotary President Mike Barton was full of admiration for the staff and the students at St. Mary’s and added, “I feel very humble and motivated as a result of my visit here today and I’m pleased that Bexhill Rotary Club can provide these funds for a once in a lifetime trip to see the Paralympics”.